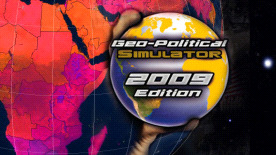 Free mode: The player's objective is to remain in power as long as possible and to further his influence throughout the world. Scenario mode: several scenarios and missions with different difficulty levels and with specific objectives are proposed to the player. The game can be played in « solo » mode against the computer or in multiplayer mode (up to 16 players). Scenarios: 30 original scenarios and missions ranging from global environment stability, energy shortages, the spreading of new diseases, terrorist threats, economic wars, military invasions, nuclear catastrophe, etc..
Interface: Inspired by information TV programs with multiple windows, on-screen video inserts, scrolling ticker tapes, ID cards for countries and personalities, etc. Player actions: The player has a number of actions at his disposal, depending on how each country operates. Wargame: Military operations are performed directly on the map. Game engine: To calculate the developments of the planet's values, economic equations and statistical diagrams are used.